If you are looking for information on the EMT USA franchise business opportunity, EMT franchises or Express Medical Transporters franchising, then you have come to the right place. 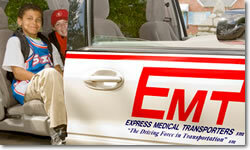 Express Medical Transporters, Inc. was founded in 1995 by its President/CEO, Bernard A. Squitieri. With more than 25 years of experience in the transportation industry, Mr. Squitieri started the company with one vehicle. Because Express Medical Transporters, Inc. owns all of its vehicles, equipment and has its own maintenance facility, we are able to eliminate the middle-man, thus reducing costs and controlling other transportation variables. These circumstances make our transportation services less expensive than using a broker or even a taxicab, while providing a higher level of service. Our drivers, and the drivers for our franchisees, are trained to assist non-emergency patients, who may be confined to wheelchairs or other mobility aids, to and from necessary medical appointments. Our drivers, and our franchisees' drivers, are D.O.T. certified and trained in first aid and CPR. Today, Express Medical Transporters, Inc. is the largest for-profit non-emergency transportation company in the state of Missouri. Make An Impact In Your Community, While Growing Your Own Business! 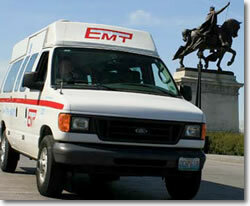 EMT USA, LLC recently began offering franchising opportunities. Although your success will be dependent of many factors, including your personal skills and commitment, and EMT USA cannot guarantee your success, we hope that by providing you with training and ongoing assistance you will be able to build a strong foundation for a successful business. Bernie Squitieri pioneered the medical transportation business and EMT is now making this business model available for those entrepreneurs that are serious about implementing our business model in other parts of the country. Extensive training at headquarters, plus start-up and ongoing assistance at your location. Comprehensive Confidential Operations Manual to provide you with guidance, suggestions, and procedures to assist in the operation of your business. Access to the latest technologies for vehicles, logistics, and key business management functions. Assistance with client outreach campaigns, local networking efforts, and national organizations. Guidance on working with government agencies, brokers, equipment and vehicle suppliers and more. We're About Helping People. And We're About Opportunity. The senior population is growing. 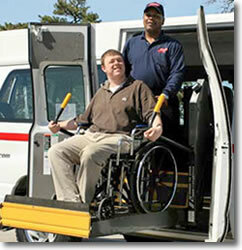 Transportation requirements for the disabled are government mandated. Brokers and other organizations are constantly seeking reliable transportation options for their clients. The community needs and the business potential are almost limitless. Whether your background is in transportation and logistics or just business management ... If you want to help those who need help ... And you recognize a great opportunity when you see it ... the EMT franchise program could be just right for you! Become part of one of the first national providers of non-emergency transportation services in the country!